WonderFox Video Converter Factory Pro is an all-in-one, fast, reliable and easy-to-use video converting software. It is capable of converting nearly all frequently used video, audio, cell phone, pad, mobile devices, etc. In addition, many useful video editing functions are available on this fast Video Converter such as merge videos, clip or cut video into parts, crop video and add video with special effect. If you are tired of compatibility issues when you just want to watch a movie or enjoy music, just feel free to use WonderFox Video Converter Factory Pro which is an all-in-one video converter fully compatible with all video formats and mainstream audio formats. Convert Videos/Audios. Convert videos to popular videos (HD 1920*1080 and SD videos) and audios, e.g. Video to HD video, video to AVI, video to MP4, video to MKV, video to WMV, video to H264, video to AVC, video to MPG, video to MOV, video to 3GP, video to MP3, OGG, AC3, AAC, MKA, WMA, FLAC, etc. 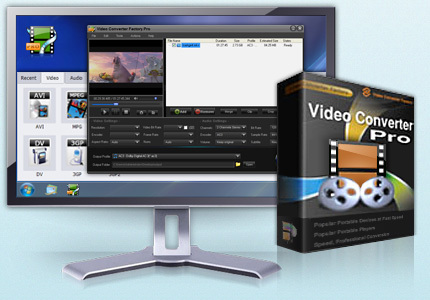 Convert Videos to web video such as YouTube, Facebook, Myspace, Yahoo video, etc. Convert Video into Portable Devices. Convert videos to a wide range of portable devices with optimized profile like video to iPad mini, The New iPad, iPad 2, iPhone 5, iPhone 4s/4, iPod series, Apple TV, BlackBerry Cell Phones and PlayBook, Sumsung Galaxy series, Tab, Note, Nexus, HTC Flyer, Vivid, One, Sensation, EVO 4G, Desire, Nokia Lumia 900, N9, N8, 5800, Sony cell phone and game player, Microsoft Surface, XBox, Zune, etc. WonderFox Video Converter Factory Pro supports batch conversion mode. You can convert multiple videos at one time. This batch conversion function (parallel conversion) enables to convert up to 10 videos at one time. Furthermore, this fast video converter supports Intel Core TM, NVIDIA CUDATM and AMD to generate faster video conversion speed. Unique encoder technology boosts 50X faster conversion speed than ever before. Crop Video to remove the black bars and Cut Off unwanted area to feature a highlight. Cut part of video to get wanted part output video, save time for the conversion process.